Amsterdam is known to many for its loose regulations on marijuana, and their infamous Red Light District, but Amsterdam is much more than these sinful indulgences! Amsterdam is home to the Anne Frank House, Rijksmuseum, and the Van Gogh Museum! It is filled with beautiful canals, stunning architecture and is a bike friendly town! My girlfriend and I traveled to Amsterdam mid-November for 2 nights and 3 days. This was our first stop in our European trip. Our stay was an ample amount of time for us to do all the touristy things and adjust from jet lag. This Amsterdam Travel Guide will cover the Best Time To Visit Amsterdam, Where To Stay, Food & Drink, Things To Do & See, and where you can find the Best Photography Spots in Amsterdam. These months aren't peak season so flights and hotels are cheaper and the weather is mild (still bring a jacket though). Very cold weather during the winter months, accompanied with short and dark days with temperature ranging between 30-40 degrees Fahrenheit. These summer months provide long, sunny days with the temperature in the low 70s Fahrenheit. The train station is conveniently linked to the Schiphol Amsterdam airport. Trains run every 10 minutes into the city center and areas around. There are ticket machines to purchase tickets and also a ticket counter to speak with someone if you have any questions. 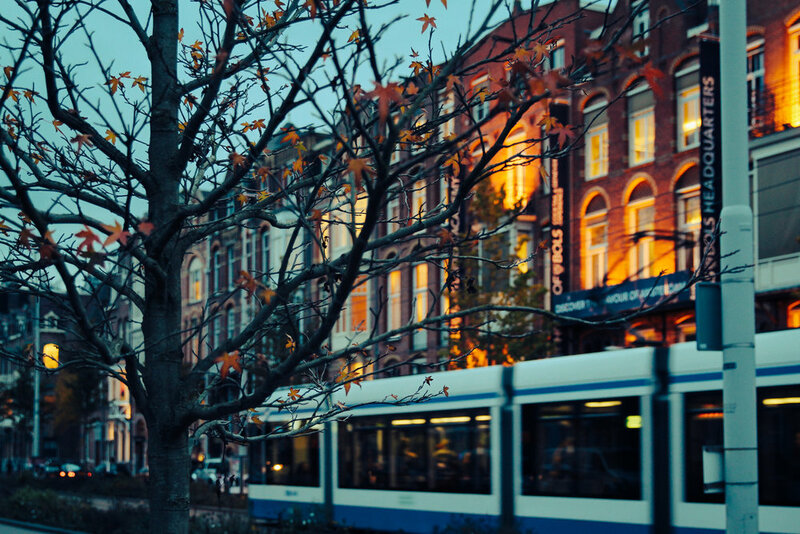 Amsterdam's trams and metro is really convenient and not too expensive. They have conductors in the front and back of the train that will help you out with where you need to go. Rent and ride if it's not raining!